Harold J. Stonewall, 63 of Northampton died Friday Jan. 12 (2001) in Lehigh Valley Hospital-Muhlenberg. He was employed by Magnetic Winding Co. in Palmer Township, retiring in April, and before that by Transformer Devices Inc., in Belvidere. Born Feb. 25, 1937, in Easton, he was a son of the late Charles Sr. and Anna Henry Stonewall. He was a member of Shiloh Baptist Church in Easton. He servived in the Air Force during the Vietnam War. 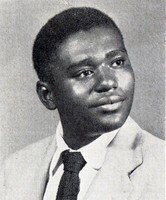 He was a 1956 graduate of Easton High School where he played football. He and his wife, the former Elsa Papier, observed their 35th wedding anniversary April 14. In addition to his wife, he is survived by a son Harold J. Jr. of Northampton; a daughter Tonita J. of Bethlehem; a brother, Charles Jo., of Easton; three sisters, Leona Woody, Betty Bland, and Gloria Taylor, all of Easton; and eight grandchildren. A son, Michael Thomas Papier; Two brothers, Daniel Henry and Edward; and two sisters, Dorothy Mathis and Christina Graves, died earlier. Services will be held at 11 a.m. Wednesday in the church, 201 Brother Thomas Bright Ave., Easton. Call 10 a.m. Wednesday to time of services in the church. Burial will be in Northampton Memorial Shrine in Palmer Township. The Strunk Funeral Home, 602 Berwick St., Easton, is in charge of the arrangements. The family requests memorials to the church building fund, Easton, PA 18042.